More and more I see couples just saying “no” to flowers and decorations. This is easy to do if you shop for a location that doesn't need help. A Beautiful garden, a historic room, or the top of the hill with a spectacular view do not need extra help added by flowers and ribbons. The couples that end up spending a lot are the ones getting married in their beloved parish church that only looks passable with a major floral face lift. Clearly the easiest way to save money on flowers is simply not to need any. Beautiful gardens with blooming plants don't need extra help from a florist. Many times couples can go to a local nursery and buy blooming plants to decorate a location and then return them the next day. Even if there is a return fee it still can save a bundle while giving you a beautiful display of flowers. 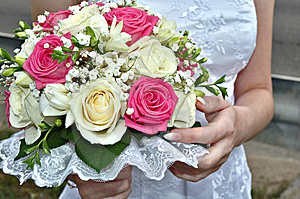 For some couples beautiful arrangements of cut flowers are truly a vital part of the wedding. They give the traditional look and help to make the statement “this is a wedding.” Gay and lesbian couples may want to make that statement. There are four important places where flowers are used at a traditional service . Flowers we wear. These include corsages, lays, and crowns of flowers to a single blooms for the hair. Flowers are carried they may be in the form of a bouquet or in baskets . Flowers decorating the location. These include freestanding arrangements, altar flowers, as well as pew and decorations garlands, or potted plants around entryways. Last of course our table decorations for the reception. For people who love flowers all of these may seem completely indispensable. But that gets very expensive. So it is important to take a good hard look at what you want before you get to the florist. Having worked at a church for years I have a vivid memories of fights over flowers. It was always surprising to me. But people do care passionately about how flowers look. Some like a very casual rustic bouquet that has the feeling of just being thrown together. Others love cascades of flowers but the person next to them associates that with wilting branches and finds it deeply annoying. Take a look at different flower arrangements as a couple. Figure out whether you like arrangements that tight and formal, larger or smaller, mono-chromatic or vibrant spring mixes. What makes a difference to you? Having sample photos in hand does more than anything else to stop the infighting. Create Your Own Wedding Flowers?